In Karimunjawa there have also been many inns built for overnight there. Transport can also be fairly easy. We can take it by taking a fast boat or boarding a flight from the city of Semarang. The natural beauty presented by Karimunjawa is no less interesting than the natural beauty that exists in eastern Indonesia. Unspoiled natural scenery, blue sea, beautiful underwater garden, and shark breeding can be found in Karimunjawa. In Karimunjawa there have also been many inns built for overnight there. Transport can also be fairly easy. We can take it by taking a fast boat or boarding a flight from the city of Semarang. 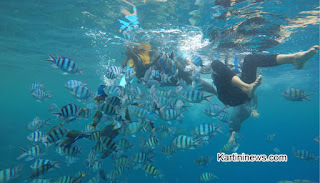 But there are some things that we must pay attention to if we want a vacation to Karimunjawa. The date selection affects the type and travel time of transportation that will be used to cross to Karimunjawa. If you want to depart from Semarang, it's better to go on Saturday or Thursday. Because there is only 1 ship departing from Semarang on Saturday and Thursday. In addition there are also cesna planes which depart from Semarang on Thursday and Friday. If you are unable to leave on that day, you must go to Jepara Regency first. There are 2 ferry types, namely Express Bahari and Siginjai. Both only have 1 departure schedule every day. To maintain our security and safety, keep on using our footwear! Because Karimunjawa Island is known to have many splinters of sharp coral, and sea urchins that can hurt our feet. Because, the coral contains a mocus substance which when scratched will leave a small amount of animal protein and calcareous material in the wound. I don't want to visit Karimunjawa if I don't eat seafood in the square. Usually the square starts crowded at 7-11 at night. Here are available a variety of fresh seafood dishes, ranging from lobster, crab, squid and super large shrimp, to shellfish. We can choose a variety of spices for the menu, there is rica-rica sauce to spicy sweet soy sauce. Similarly, the method of processing, fried or burned according to our tastes. Well, this is also what we must pay attention to before going to Karimunjawa. The electricity there only lights up from 5pm to 6am. We recommend that you immediately charge the handphone or power bank, when the electricity is on. Of course when the electricity goes out during the day, we can spend time outside with various exciting activities on the beach. When night comes, there is usually a bonfire party held in several homestays. Guaranteed to add a sense of togetherness between tourists, both local and foreign.